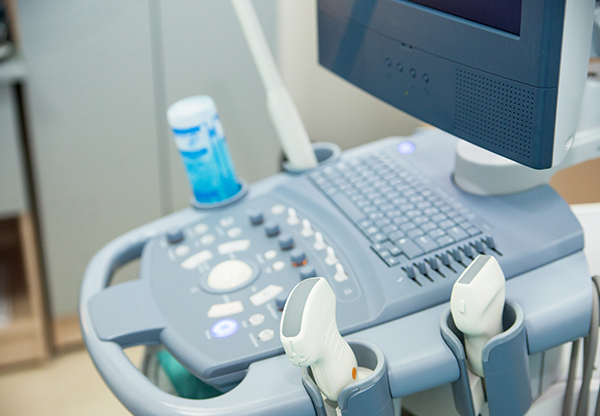 Ultrasound (USS) uses high frequency sound waves that are transmitted using a transducer (hand-help probe) applied to the body, to produce pictures of the insides of our organs, bones and joints, muscles, tendons and ligaments. Unlike X-rays, USS does not involve the use of radiation and is usually a safe, painless and quick imaging test. USS is a live, real-time scan where both static and dynamic images or videos can be produced. They may also be used to guide radiologists during certain diagnostic and therapeutic procedures e.g aspirations or injections. You will normally lie on a bed or sat up in a chair whilst the radiologist scans you. The USS probe is placed over the skin and with the use of a lubricating gel, it is moved around the skin to get live, dynamic (moving) images of structures commonly seen like bones and joints, tendons and ligaments etc. Most diagnostic musculoskeletal USS scans can take between 10-20 minutes, whilst USS-Guided injections or interventions can take a little longer, and it all depends on what and how many different regions require scanning. Your appointment letter will explain how to prepare for your scan. Usually there is no significant preparation required for USS in the musculoskeletal setting. After most other USS scans you should be able to return to your normal activities immediately. If you have had an injection containing local anaesthetic under USS-guidance, then it is advisable not to drive or operate any heavy machinery on the day of the test, to allow you to recover safely. Ultrasound scans use high frequency sound waves. The sound waves generated from the probe or transducer, bounce off (reflect) different tissues in your body, creating ‘echoes’. These reflecting echoes are then picked up by the probe and turned into images on the screen using a computer processor. Ultrasound scans are considered very safe as they obtain images using sound waves rather than exposing you to any radiation.